On April 16, 2016, I got the opportunity to address a group of investors in an event “Investor Club” organised by MoneyLife Smart Savers, courtesy Mrs Sucheta Dalal, Managing Editor of Moneylife and Mr Debashis Basu, Editor of Moneylife. The session focused on the assessment of management quality while buying stocks. I was touched by faith reposed by the audience in me, who had come to Mumbai to attend the session from the locations like Vishakhapatnam, Trivandrum, Kochi, Surat, Pune etc. The feedback of the session from the audience was very good and it was felt that the content was useful to investors while making investment decisions. The current article, which is the last part of this series, highlights the key steps/tools that investors should use to find out a good management and avoid bad management. An investor should read these carefully and inculcate them in her stock analysis process so that she may avoid falling into the trap of unscrupulous managements that try to benefit at the cost of minority shareholders. Additionally, this article also contains answers to some of the important queries asked by investors about different aspects of management analysis. Checking the background of the promoters’ is the first step in the assessment of the management of any company. A background check might mean different things for different investors. Some may stress on educational qualifications while others may focus on the family background, however, I advise investors to focus on the past management decisions of the promoters. Educational qualifications do not give the investor any idea about the shareholder friendliness of the promoters. Shareholder friendliness is reflected in the character and integrity of the promoters/management. Therefore, the investor should focus on promoters’ past decisions and try to assess whether those decisions were taken while keeping the interest of minority shareholders’ in mind. Brooks Laboratories Limited, established in 2002, is a small cap company with market cap of about ₹110 cr. It is active in contract manufacturing space and boasted of big names like Zydus Cadilla, Alembic, Wockhardt, FDC, Alkem etc. in its clientele. As the company was acting like a cash machine, it was able to generate surplus cash after meeting debt repayments and was accumulating cash reserves year on year. Finding a company with such performance is a dream for any investor and I was very happy to have chanced upon Brooks Laboratories Limited. It is essential to search for the name of the company with certain keywords like “Fraud, Issues, SEBI, Dispute, Court etc.” One such search attempt should give an investor about any critical information that might be present in the public domain. 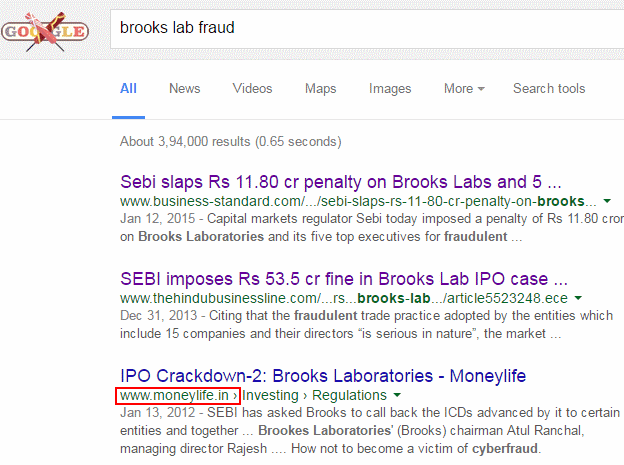 Readers would notice that one of the results about Brooks Laboratories Limited is from Moneylife. In current times, Moneylife is very active in writing about corporate frauds and it is highly likely that if any listed company has been involved in any issue, then Moneylife would have covered it on its website. Therefore, investors may use the keyword “Moneylife” as well to search for the issues related to any company. The check of promoters’ background for Brooks Laboratories Limited reflected that they were involved in defrauding public investor in their IPO and have siphoned off the investor’s money from the company. As per the below article in Businessline, SEBI found them guilty and imposed penalties on them. After learning about the frauds conducted by the promoters, I decided against invested in Brooks Laboratories Limited. Thus, investors would notice that a simple Google search could be very useful tool in assessing management quality of any company. Therefore, one of the essential tools for any investor is to do a background check of company’s promoters at Google, to assess whether they are shareholder friendly. The investor would notice that the company took the notice from RBI seriously and within a few days clarified its stance about RBI’s instructions. And most importantly, Manappuram Finance Limited established a committee under the chairmanship of Mr Jagdish Kapoor, former deputy governor fo RBI and chairman of HDFC Bank to improve the governance standards of the company. Moreover, reputed companies like Amarchand Mangaldas and KPMG were appointed to help this committee. These actions reflected the intention of the company to comply with the regulator’s intentions in letter and spirit in sharp contrast to some other corporates who try all the options under the sun to fight regulators be it in courts or media. March 15, 2012, Press Release: Marquee PE investors led by Baring India, Sequoia Capital, and Siguler Guff buy 4.75% of Manappuram Finance Limited from Promoter on the stock exchange. 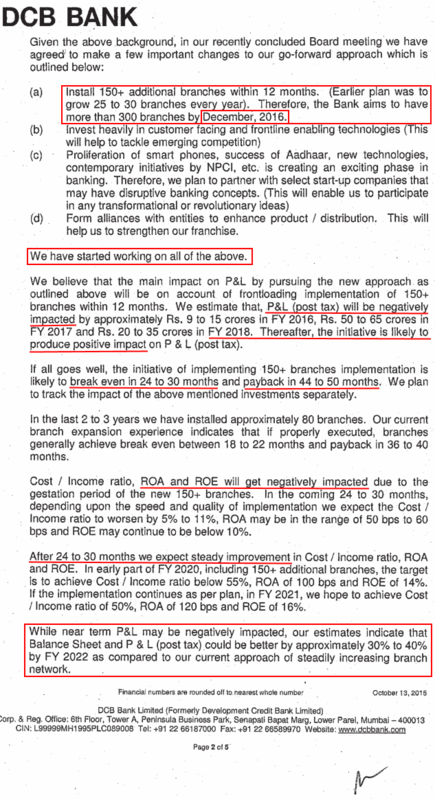 Thus we see that the promoters of Manappuram Finance Limited accepted the directions of RBI, stopped collecting the deposits, took steps to enhance the corporate governance, raised funds by selling personal stake in the company and then deposited the money in an escrow account with a public sector bank as the source from which outstanding deposits would be paid on maturity. These steps took care of interests of every stakeholder: MAGRO depositors and Manappuram Finance Limited & its shareholders. And all these events happened within a short period of about one month. Such events establish that the promoter kept in mind the interest of outside stakeholders while taking his decisions, which is one of the essential qualities to look for while investing in any company. Mr Nandakumar had started Manappuram Finance Limited in 1992 with a capital of ₹10 lakh. He used to add his money to the capital every year so that the capital grew. Then NBFCs required a minimum of ₹3 crore paid-up capital to list at the BSE. In 1995, Manappuram Finance Limited achieve a capital of about ₹1.25 crore. Mr Nandakumar asked for small investments from his family members and friends and could raise another ₹1.75 Cr. to meet the regulatory requirement for the IPO. However, as mentioned in the interview, soon after the IPO, the share price reduced from ₹10 to ₹8 per share and the investors started asking him to compensate for the losses. Mr Nandakumar bought back the shares that traded in the market for ₹8, at ₹10 from these investors to keep his word. This is in stark contrast to the case of Brooks Laboratories Limited, which defrauded investors and siphoned off the money from public investors. Therefore, looking at the contrasting cases of Brooks Laboratories Limited and Manappuram Finance Limited, an investor would appreciate the different kinds of managements that are present in the listed companies’ marketplace. The investor would also appreciate the need for differentiating between these managements and the key role that a background check can play in avoiding bad managements and find out good managements. Therefore, a background check by way of Google search is the first step for assessing the management of any company, which every investor should mandatorily do. We should do similar checks about independent directors as well. Many times we see that independent directors constitute ex-bureaucrats, industry professionals etc. We should form our opinion about whether the business requires ex-bureaucrats on the board. Though ex-bureaucrats bring a lot of administrative & management experience to the table, however, such positions might have been offered as a reward for favour done while on job or as a liaising officer for government approvals & contracts. Such arrangements can be indicative of crony capitalism. However, an investor needs to make her own call about such matters. Once the investor is convinced that there is nothing to question the character & integrity of promoters & directors, she should move ahead with further analysis. The salary taken by the promoter/management of the company is one of the key parameters that can give critical insights into the management intentions. Salary/remuneration data of promoter/management/directors is provided by the company in annual Report. This data is not available in the public financial sources like screener/moneycontrol etc. Therefore, it is essential for investors to read the annual reports to assess the management on this parameter. After analysing many companies as part of my stock selection process and for answering queries of readers, I notice that the usual salary range for promoter directors/management is about 2-4% of net profit after tax (PAT). The salary generally contains 2% commission on PAT and a fixed monthly component along with other perquisites. 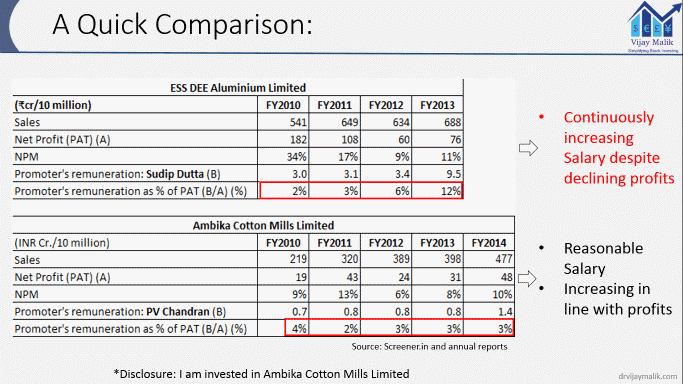 An investor can see the sharp contrast between the salaries being taken by promoters of ESS DEE Aluminium Limited and Ambika Cotton Mills Limited. Remuneration of Mr Sudip Dutta, the promoter of ESS DEE Aluminium Limited has increased from ₹3 Cr. in FY2010 to ₹9.5 Cr. in FY2014 whereas the net profit of the company has decreased from ₹182 cr. to ₹76 cr. over the same period. The salary as a percentage of net profits has increased from 2% in FY2010 to 12% in FY2014. An investor might question the basis of the increase in remuneration of the promoter even in the scenario of declining profits. Such kind of remuneration practices that are not linked to the performance of the company effectively serve as a means for the promoters to benefit at the cost of company shareholders. has increased only in the years when the profits have witnessed an increase. In the years, when the profits did not increase, the salary remained constant. the salary increased beyond ₹0.8 cr. in FY2014 when the profits of the company increased to ₹48 cr. which was more than the previous high watermark of ₹41 cr. achieved in FY2011. ESS DEE Aluminium Limited came into my investment radar in 2013, however, after analysing it I decided against investing in its shares. The high salary of the promoter which was continuously increasing without a proportionate increase in company’s performance was one of the primary reasons for avoiding investment in ESS DEE Aluminium Limited. Recently, when I revisited the company, then I noticed that the company is reeling under debt of about ₹500 cr. and has been making losses since last 2 quarters (September and December 2015) and its share price has declined from about ₹750 in February 2014 to about ₹90 in May 2016. 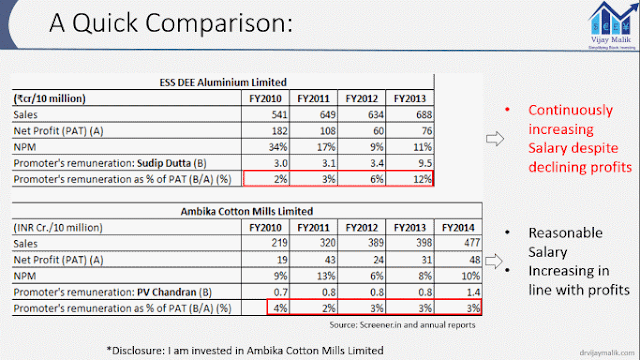 Out of multiple factors that I liked about Ambika Cotton Mills Limited, the reasonable salary being drawn by Mr Chandra along with the moderate level of salaries being paid by the company to potential successors (daughters of Mr Chandran), was an important parameter that helped me take the final investment decision about the company. As I have mentioned in the article above that bad habits persist, similarly, good habits also persist in people. The notification mentioned that Mr P. V. Chandran has decided against accepting the commission part of his remuneration, which was calculated at 2% of the net profits of Ambika Cotton Mills Limited. This notice meant that Mr Chandran would be taking only the fixed component of his salary, which is about ₹2 lac per month. Mr Chandran highlighted that he is satisfied with the dividend that he receives from Ambika Cotton Mills Limited, just like minority shareholders and that he does not want to receive any special treatment different from other shareholders. Mr Chandran stresses upon living up to the faith reposed by minority shareholders in him. I calculated that that the promoters of Ambika Cotton Mills Limited would receive about ₹4.28 cr. in the dividend in FY2016 for their 48.63% stake in the company. ₹4.28 cr. per annum seems sufficient for living a good lifestyle in India unless one plans to live very lavish life associated with private jets and parties at private islands. I respect such managements, who respect the minority shareholders (Ambika Cotton Mills Limited) and don’t mind taking a financial hit to keep their words (Manappuram Finance Limited). I like to invest in the companies run by such managements and stay invested as their partner in the growth of the business over long periods. Related party transactions section is one of the essential parts of the annual report that every investor should analyse in detail for every company that she plans to study. This section discloses a summary of all the transaction/balances at year end for the dealings that the company made with promoters and their personal entities, joint ventures etc. during the year. Related party transaction section is a goldmine of the information for assessment of any management. By studying each transaction in this section, an investor can conclude whether the promoters are benefiting from the company at the cost of minority shareholders. Rexnord Electronics & Controls Limited founded in 1988, is a Mumbai-based small-cap company with a market cap of about ₹45 cr. The company is a manufacturer of fans: AC Axial Fans, DC brushless fans, condenser cooling, evaporator, no frost, water cooler and gear motors. While reading the annual report of Rexnord Electronics & Controls Limited for FY2015, an investor notices that the company has sought shareholder’s approval for an agreement, which the company has already entered into with M/s Excelum Enterprises. The agreement is for sale & purchase, payment of commission on sales including overseas sales and reimbursement of expenses to Excelum Enterprises. Excelum Enterprises is owned by Mr Kunal Tanna, who is the husband of Ms Nanny Tanna. Ms Nanny Tanna is the daughter of founder promoter & chairman of Rexnord Electronics & Controls Limited, Mr Kishore Chand Talwar. Therefore, we notice that Rexnord Electronics & Controls Limited is entering into a transaction with the son-in-law of the founder promoter of the company. When an investor analyses the annual report further, then she notices that until last year (FY2014), Mr Kunal Tanna was working at Rexnord Electronics & Controls Limited, as the Vice President – International Business. To an outside observer, the current arrangement of payment of commission on sales to Excelum Enterprises by Rexnord Electronics & Controls Limited seems like paying to Excelum for the skill that its proprietor (Mr Kunal Tanna) has learnt by working at Rexnord itself. Moreover, a look at the salary structure of the promoter family for FY2014 highlights that Mr Kunal Tanna was being paid the highest remuneration in the company even higher than the salary of founder promoter & Chairman Mr Kishore Chand Talwar. I believe that it is good if relatives of the promoter join the company as employees/directors and contribute to the growth of the business and take a commensurate salary for their contribution. Family members at key positions ensure continuity of the business as well as relatively stable loyalties when compared to professionals who keep on shifting their loyalties by giving 90 day notice periods. However, the investor should become circumspect when she sees the promoter family members entering into contractual agreements with the company. This is because, as in case of Rexnord Electronics & Controls Limited, when two members of the family, a father-in-law, and a son-in-law sit across the table to decide what percentage of commission would be paid to the company of son-in-law, then the minority shareholder can only pray that they would have her best interest in their mind. In related party transactions, many times, investors will find cases where the company has given the same amount of loan to a counter party and takes it back within the year. Such transactions also need scrutiny. It might be that the company wants to help the third party with money but wants to avoid showing it as a loan in the balance sheet. On the contrary, it might be a transaction as well with a genuine reason. In such cases, looking at previous annual reports to find out similar pattern will help the investor in getting more information that is relevant and in turn make an informed decision. Warrants are like options which are issued to select shareholders by the company that gives these shareholders a right to convert these warrants in to shares of the company at a predetermined price. Like options, warrants come with an expiry date i.e. the period in which the warrants can be converted. Over the years, promoters/majority shareholder have been treating warrants as a means to give special treatment to themselves. The special treatment might be related to pocketing risk free gains and to gain/increase stake through backdoor channels. This usually happens in cases where the warrants are issued and become convertible right from the date of issuance. In cases where such immediately convertible warrants are issued at a discount to the market price of the stocks of the company, then it amount to handing over free money to promoters/majority shareholders as promoters do not need to anything else other than convert the warrants into shares the same day and sell these shares into the market to pocket the amount of discount as a risk free gain.Even though the allotment price of warrants is guided by statutory regulations by SEBI and the price of allotment would be in compliance with the regulations, however, the point to note here is that if the promoters would have tried to buy shares from the market, then they would not have got it at the prevailing price. Instead, the news of an attempt by promoters to buy shares from the market would have led to significant increase in share price and in turn leading to an increase in the cost of acquisition of shares to the promoter. However, by way of warrants, this effect of an increase in share price of the company is reversed. The increase in share price which would ideally lead to a higher cost of acquisition of shares (if promoters would have bought shares from the market). However, through warrants, by freezing the cost price of shares at a pre-determined price, the promoters convert the impact of the increase in share price to their advantage by getting a call option payoff. As per the disclosure, at September 23, 2014, Rexnord Electronics & Controls Limited had allotted 3,478,800 warrants to its promoters at a price of ₹13.40. Each of these warrants was convertible into one equity share of the company. The promoters could convert these warrants into equity shares at any time within 18 months from the date of allotment (September 23, 2014).The eligibility to immediately convert the warrants is the key here because the closing market price of shares of Rexnord Electronics & Controls Limited at September 23, 2014, is ₹23.34. This effectively means that the promoters can convert the warrants allotted to them on September 23, 2014, the very same day at ₹13.40 and sell the resultant equity shares received into the market at ₹23.34 and pocket the difference of ₹9.94 per share as a risk-free gain, which ideally would have been their cost of acquisition of shares, if they would have tried to buy shares from secondary market as the market would have immediately increased the share price. (Promoters got rights to 3,478,800 shares through warrants, whereas the average daily trading volume for Rexnord on the stock exchange is only a few thousand shares). The total risk free gain pertaining to the issued 3,478,800 warrants amount to ₹3.36 cr., which is the free money handed over to the promoters by the company. Let’s see what further benefit the warrants bestow upon the promoters/majority shareholders. In FY2015, the promoters of Rexnord Electronics & Controls Limited increased their shareholding from 46.47% at March 31, 2014, to 51.46% at March 31, 2015, by increasing their shareholding by 888,300 shares. This move is very significant from the perspective of promoters as it gives them a majority in the shareholding of the company. However, when an investor analyses deeper, then she comes to know that the entire increase of 888,300 shares in the holding of promoters had happened by way of conversion of warrants at December 13, 2014, when the promoters had converted 1,098,300 warrants into equity shares of Rexnord Electronics & Controls Limited. The issue to be focused here is that promoters have acquired these additional shares on December 13, 2014, at the warrant conversion price of ₹13.40 instead of the market price of ₹22.85 for the shares of Rexnord Electronics & Controls Limited on that day. Investors who have spent some time in equity markets would realize that when the promoters start to buy shares in their company, the market sees it as a very positive sign and it increases the market price immediately. However, in the case of Rexnord Electronics & Controls Limited, the promoters instead of paying a premium to market price to increase their stake in the company, got these shares at a deep discount to the market price. Therefore, effectively the non-promoter shareholders, including retail shareholders, of Rexnord Electronics & Controls Limited had subsidized the purchase of shares by the promoters. And this was made possible by an ingenious instrument: Warrants! Therefore, whenever an investor is analysing a company and she comes across issuance of warrants to promoters/majority shareholders, then she should analyse the issuance and exercise of these warrants to assess whether the management/promoter/majority shareholders is benefitting at the cost of minority/retail shareholders. Running a business as well as investment in equities demands long term vision. A promoter/manager is expected to create wealth for the shareholders and take decisions that are beneficial for the business over the long term and not be primarily concerned about short term implications. Similarly, a long term value investor should consider holding her investments over many years and not get worried about periods of share price declines in the interim period. However, many times we see that the promoters/managers are constantly worried about the share price of the company, which is heavily influenced by daily level changes in the operating environment. Such kind of management is hardly willing to take the strong decisions that might be needed for long term benefit of the business and in turn for shareholders. Therefore, an investor should always analyse past decisions of the promoters/managers to assess whether their decisions have been motivated by long term vision or the short term share price fluctuations. Let’s see a recent incident, which presented a pertinent example to this issue. DCB Bank has its origins in the merger of many co-operative banks in the 1930s. It was granted the scheduled bank license by the Reserve Bank of India in 1995. Renowned Tata group bought 4.6% in DCB Bank in 2007. DCB Bank is covered by many big brokerages and has been a favourite among many of them to the extent that Motilal Oswal Securities in its 19th Annual Wealth Creation Study (2009-14), released in December 2014, selected DCB Bank as a stock with a potential of giving 100 times return to the shareholder on their investment. The analyst pointed out that in the evaluation of a common stock, the management is 90%, industry is 9% and other factors are 1%. I completely agree with this belief and therefore assume that the analyst which assessed DCB Bank for the report, would have dedicated at least 90% of the research time in assessing the management of DCB Bank. It had done detailed planning for this business strategy and expects that the cost ratios and in turn profits would be negatively impacted in the short term horizon of about 2-3 years but these decisions would create long term wealth for the shareholders from FY2019 onwards. The Bank has done in depth planning by assessing various parameters like probable break even, payback, return on equity, return on assets etc. and the management seemed to be in the know of the steps that they are taking. The management seemed an ideal one, which prioritizes long term interests of the business over the short term incentives. I find that such bold managements are in rarity now a days and appreciate such managements. However, the markets were spooked by this announcement. 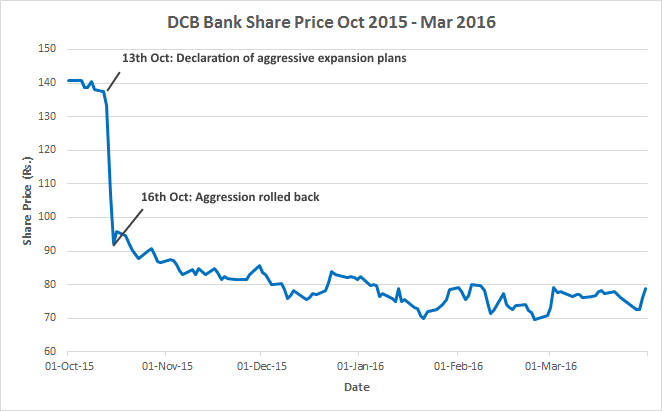 The share price of DCB Bank tumbled 30% in a span of two days from ₹133.45 at October 13, 2015, to ₹92.35 at October 15, 2015. In quick succession, Edelweiss downgraded DCB Bank to sell. 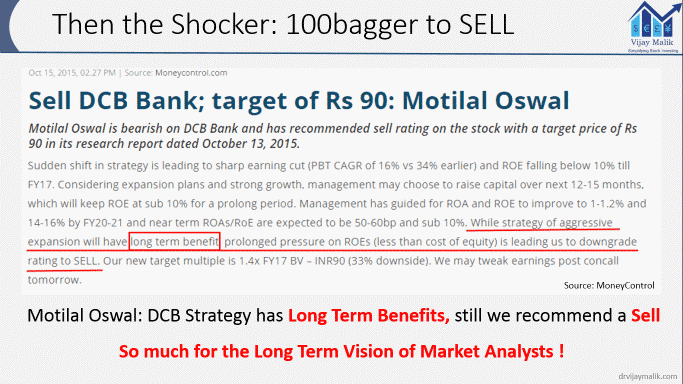 However, the real shocker was next to come when Motilal Oswal Securities, which has cherished DCB Bank as a potential 100bagger, downgraded it to a “Sell”. Any long term investor would be surprised to read the opinion of Motilal Oswal Securities in its “Sell” recommendation. It stated that despite acknowledging that the business strategy of DCB Bank is beneficial to business in the long term, we are recommending a “Sell”. So much for the long term vision of the market analysts! The story is not yet over. This announcement meant that the business plan, which seemed to have been devised well after a detailed background work, proper research with possible challenges in execution and their responses in place, was changed based on feedback from analysts. 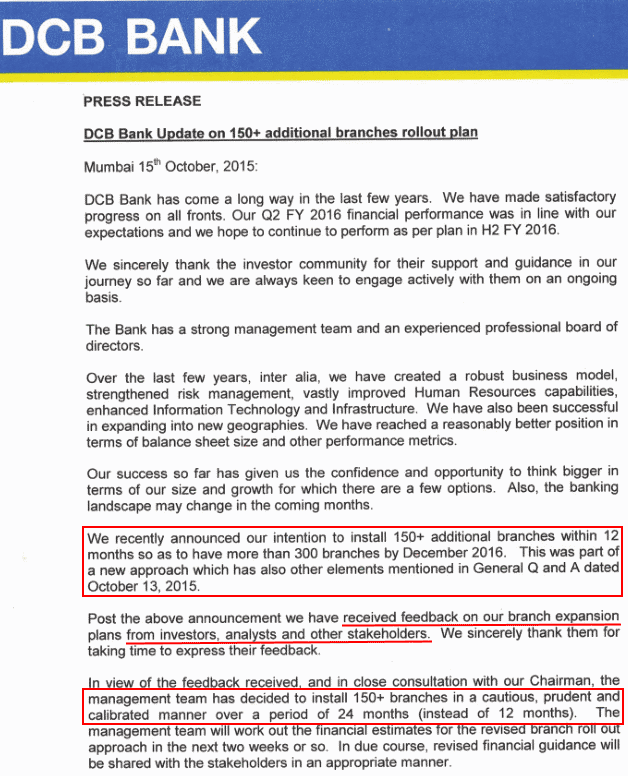 To stress, this was the feedback from investors and analysts who might not have worked in a bank branch and would have hardly done the research and hard work that DCB Bank staff might have done to devise the business strategy. This was a complete “U” turn from the earlier strength and boldness expressed by the management. This demanded a deeper assessment. One possible answer seemed to lie in the annual report for FY2015 on the page detailing the employee stock options outstanding for the Bank. It showed that at the end of FY2015, DCB Bank employees had about 1.1 cr. (11 million) options outstanding, which were exercisable at a weighted price of ₹47.29. 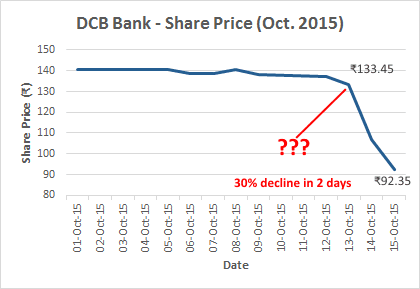 On October 13, 2015, when DCB Bank’s share price was ₹133, these options (ESOPs) had a value of about ₹95 cr. to their holders. And as per the prevalent corporate culture, a huge majority of these ESOPs are expected to be in the hand of top very few senior management employees. On October 15, 2015, when the DCB Bank’s share price fell to ₹92, the value of these 1.1 cr. options had declined to ₹50 cr. That is a decline in value of a whopping ₹45 cr. and that too primarily from the hands of top very few senior management employees. A decline of ₹45 cr. in wealth (whether real or notional) is very significant for any salaried employee. This significant decline in value of ESOPs presents one probable explanation to the almost U-turn that the DCB Bank management did on its business strategy based on apparent “Analyst” feedback. So much for the long term vision of the management! Neither the analysts nor the management is willing to bear the short term pain for long term gains. The stock price, which is continuously hovering around ₹70-80 potentially reflects the shaken faith of the markets in the management of DCB Bank. Therefore, it is always advised that whenever any investor analyses any company, then it becomes imperative for her to assess whether the past decisions of the promoters/managers have been motivated by long term business vision or short term share price fluctuations. Reading annual reports, the presence of significant amount of ESOPs and going through stock exchange filings can help her reach a decision about such behavior of promoters/managers. One of the key features of stock investment that attract investors is the dividend payment by companies. Stock investors hold regularly dividend paying companies in high regards and believe that the managements that consistently pay dividends are shareholder friendly. However, before an investor firms up such a belief about any management, it is crucial to assess that the company is paying these dividends out of the free cash available. It is highly likely that if a company does not have free cash flow available after meeting capex requirements from its operating cash flows, then it is meeting the requirements of funds to pay dividends to shareholders by raising debt from lenders. And investors would agree that if a company keeps on paying dividend consistently by raising debt, then sooner or later the debt will reach such levels that lenders would find it difficult to keep giving loans to it and the dividend payments would not remain sustainable. Similarly, if the company does not have positive free cash flow and uses debt to pay dividends, then hypothetically there is no limit on the amount of dividend it can pay to shareholders. The dividend amount is only limited by the debt that the company can raise, be it a dividend of ₹1 per share or ₹100 per share the only thing that the management needs to do it to find a lender who can give it a loan and it would give the money to shareholders. The operating efficiency of the company does not remain the key parameter for such managements to pay dividends to shareholders. Therefore, it is advised that investors should not take any comfort from the amount or consistency of dividend payments by a company that uses debt to pay dividends. Moreover, many times such debt funded dividend payments are to benefit the promoter/majority shareholder at the cost of the company and in turn at the cost of minority shareholders. The cash flow from operations (CFO) of Tata Steel for 10 years (FY2006-15) stood at ₹105,565 cr. whereas it did capital expenditure (Capex) of about ₹126,073 cr. over the same period, which included massive ₹49,713 cr. in FY2008 primarily to acquire the European steel giant “Corus”. The net result was that over the 10 years (FY2006-15), Tata Steel had a negative free cash flow (FCF) of ₹20,508 cr. (FCF = CFO – Capex), whereas it kept on paying dividends consistently every year and paid out about ₹9,547 cr. of dividends in 10 years (FY2006-15). As the company did not have free cash flow to pay dividends to its shareholders, it was not surprising that the dividend payments primarily came from debt, which increased from ₹3,377 cr. in FY2006 to whopping ₹80,701 cr. in FY2015. There is always a limit to which a company can take debt as with increasing debt levels, the lenders would become increasingly worried about the health of the company and in turn, would stop giving further debt to the company. Therefore, such debt funded dividends are not sustainable in the long term and investors should not derive any comfort from them. Many times, instead of working hard to grow the business managements resort to the shortcuts and manipulate the publically reported financial results to create a false image that the company has been doing very well. However, sooner than later, invariably such accounting manipulations are caught and the market heavily punishes the stocks of such companies. In such cases, it is the minority shareholder who loses her entire investment in the company without any of her faults. Therefore, identifying accounting juggleries/shenanigans becomes a very important aspect of stock analysis. After going through the above-mentioned article and reading the book mentioned therein “Financial Shenanigans: How to Detect Accounting Gimmicks & Frauds in Financial Reports”, an investor would realize that there are certainly red flags, which most of the manufactured balance sheets contain. If an investor is able to detect these red flags and avoids investing in such companies, then she would be able to steer clear of most of the accounting frauds. This situation primarily appears in companies, which book sales aggressively, sometimes even fictitiously. Such sales do not result in receipt of cash and therefore, lead to increasing account receivables/debtors/trade receivables. However, as the company has to incur operational costs like employee costs, utility costs etc., it typically relies on debt to meet its expenses. Therefore, unless an investor personally knows that the promoters/majority shareholder in such companies is a person with integrity and that the buyers are facing a genuine financial crunch, which is leading to delayed payments, she should be better off avoiding such companies. Such a situation is usually avoided by companies as raising funds by debt and keep them as cash without deployment is a losing scenario as it has a financial cost attached to it. Debt invariably has a higher cost than the bank FDs or liquid investments in which cash is usually held by the companies. Therefore, an investor should do extra due diligence whenever she is faced with such a situation in her target company. The company might have many explanations to keep high cash alongside high debt on its books. Most common answer is that the company is looking for a strategic acquisition and therefore keeping the cash chest ready in case any opportunity arises. However, most of the times companies do not find good acquisition targets soon and therefore the continued presence of high cash with high debt raises concerns for shareholders. In cases of accounting frauds, it has been seen that the debt shown is a true figure whereas the cash shown in the balance sheet turns out to be fictitious. Most of the times such cash has already been siphoned off from the company by the promoters/majority shareholders/management. Therefore, it companies with high cash balances along with high debt should always be subjected to deeper scrutiny by the investors. Acquisitions are usually done by companies to get bargain deals in times of stress in the industry. Acquisitions are done by overseas companies in new markets/geographies to get access to the approvals, patents that the target company would have in order to shorten the time to enter a new market. However, acquisitions always pose a challenge to investors as the merging of accounts of two companies using multiple assumptions, mark to markets, revaluation of assets etc. completely mixes up the accounts. Therefore, it becomes utmost difficult to assess the real financial position by analysing the accounts of the merged entity. No wonder, many accounting frauds remain hidden in the books of serial acquirers and companies find acquisitions as the most convenient method of fooling the analyst community about their real financial position. Still it’s ok if a company acquires a target company once in a while for business reasons and assimilates & nurtures the target company as a part of its own entity. However, things start to become suspicious if the acquirer acts like a hedge fund and frequently buys & disposes of companies. Ideally, an investor should avoid companies that are in a habit of growing only through acquisitions. She would do great good to her hard earned money as invariably serial acquirers are known to give negative surprises to shareholders. Assessing the competence of promoters/management is a key aspect of stock analysis. However, the competence must not be confused with the educational qualifications of the promoter/management. Time and again evidence have proved that educational qualifications tell little about managerial competence and integrity with which a person would treat its business & shareholders. Instead, an investor should focus on assessing the project execution skills of the promoter/management. She should analyse the business expansion done by organic growth and ignore the capacity additions through acquisitions while she assesses the competence of the management. Successful execution of increase in production capacity especially by green-field/brown-field plants is a good indicator of competent management. It is very good if the capacity addition has been done without facing any delays. Such project execution skills are a very good trait of competent management. The investor can take help of multiple public sources of information to assess the project execution skills of promoters like annual reports, credit rating reports, milestones on the company website etc. She should focus on organic additions to business capacities and take note of the various warning signs. The investor should prefer buying shares of companies that are run by managements, which have displayed timely completion of the projects within promised timelines. Ideally, the promoters should have a majority shareholding in the company i.e. more than 50%. However, more than the absolute level of shareholding I believe that the trend of change in promoters’ shareholding carries more significance. A trend of increasing shareholding by promoters/majority shareholders over recent quarters/years should be seen as positive and vice versa. Many times, it is noticed that promoters dilute their stake a lot in initial years to fund the business expansion of the company. Promoters then try to make up for the lost stake earlier by buying shares from the dividends, which they get once the company starts generating cash flow for its shareholders. Therefore, unless the promoters’ stake is very low i.e. less than 25%, an increasing trend of shareholding over the years shows promoters’ faith in the business. On the contrary, the companies where promoters have been reducing their stake should be subject to deeper analysis despite such promoters holding more than 50% stake in the company. Purchase of shares of a company by its promoters is the sign of a good promoter. It shows that promoters believe that shares of the company represent good investment opportunity at current prices. An investor would appreciate that, no one knows about a company better than its promoters do. Therefore, when promoters buy shares, you should buy too. However, selling of shares by promoters is not necessarily a negative sign. Company’s shares are usually promoter’s biggest asset and they sell it whenever any cash requirement arises in personal life. As per Peter Lynch, in an average company, for every insider buyer there are about three insider sellers. Popular belief is that higher FII holding is better as such companies are extensively tracked by market analysts. Information and opinions about such companies is easily available in public sources. There is no surety that FIIs are always right with their investment decisions. Decision makers at FII investment committee are also human being and they too make mistakes and lose money in markets. 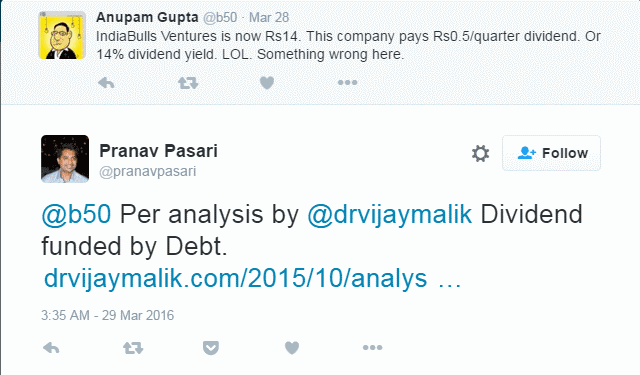 I prefer to do my own research about companies and not get swayed by existing investment by any FII. FII investment is not a great comfort. There are many reasons for FIIs to buy a stock. Not all these reasons are related to quality of the company. Sometimes FIIs are sold monkeys by target driven investment bankers/merchant bankers. An investor may also fall in the same trap if she gets influenced by FII holdings. The investment value of companies with high FII stake has already been recognized by the market & investors. Stocks of such companies already trade at high valuations (P/E multiple). Therefore, the returns from expansion of P/E multiple is excluded for an investor in such companies. Finding good companies is like a treasure hunt and I like to find companies before other market participants recognize the value of a good company. I usually search for investment opportunities in small market capitalization companies and try to invest in good companies in this space before they grow further, become big and get noticed by other large investors like FIIs. Equity investing is a long-term concept where an investor is expected to hold on to the good companies for years, sometimes even for decades. In such a long-term association with the company, the assessment of management succession becomes paramount. Therefore, an investor should always study the succession plans in depth before investing her hard earned money in stocks of any company. Companies usually follow either/mix of two approaches for management succession: bringing in promoters’ children/young family members or professionals in the company. There is no ideal succession plan as both have their pros and cons. Companies with lot of family members in the senior management run the risk of related party transactions at the cost of interests of minority shareholders as discussed in this article above. Whereas the companies with all the professionals at senior management positions run the risk of business decisions with short-term focus on share price as mentioned in the this article above. Companies with predominantly professionals’ presence suffer from lack of loyalty as professionals keep on shifting their loyalties by handing over notice periods of 90 days (i.e. resignations and job changes). Therefore, I prefer companies, which have a promoter in charge of the company and who has delegated day to day functioning of the company to professionals hired from the market who bring in fresh perspectives, market intelligence and competitors’ knowledgebase to the company. These are the critical tools which an investor should use to differentiate a good management from a bad management. I believe that if an investor assesses the management of her target company on these parameters and finds that the promoter/management is scoring well on all these parameters, then she has found a company which is being run by a competent and shareholder friendly management. In such a case, if the company meets all the other parameters like financial, business, valuation and operating performance/efficiency parameters, then she should buy shares of the company and look forward to a long association with the promoters. 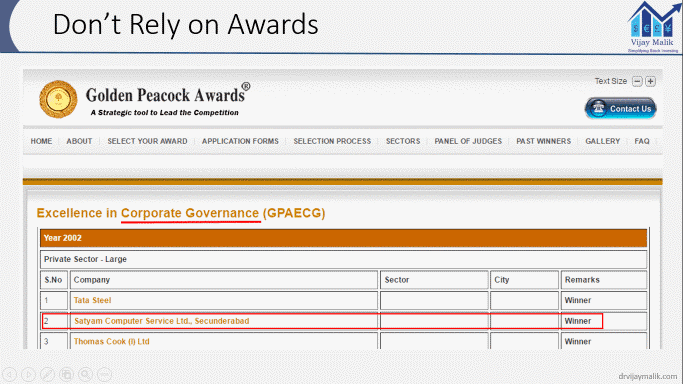 The Golden Peacock Award for corporate governance in 2002 was won by Satyam Computer Services Limited, which later on turned out to be the biggest corporate frauds in India. Therefore, invariably, an investor should do her own research while investing her hard earned money. It feels fulfilling to notice that drvijaymalik.com is able to help investors to make opinions and in turn take investment decisions that are good for the long term. Let us now address some of important queries related to management analysis asked by investors. Investors’ Queries: How to do Management Analysis of Stocks/Companies? Why do promoters hold shares in their companies through different companies and not in their individual names? Why is the shareholding of promoters in any company usually in the names of different companies and not in their individual names? Is this a common practice to have promoters’ shareholding in different companies’ names? Can this lead to chances of manipulation and fraud in any way? Many times, promoters hold shares via companies and therefore, the name of the companies in whose name shares are held is shown in the list of shareholders. It allows promoters to create multiple layers in the shareholding structure and this, in turn, helps them create holding companies, create cross holding structures, raise equity at different levels in the shareholding structure and also in succession planning of family assets among different stakeholders/family members. However, it also makes it difficult to find the true identity of the person who might be the real economic beneficiary of the shares. Therefore, multilayered shareholding has its benefits as well as pitfalls. It differs from person to person, what they choose to use it for. Does high dividend payout indicates incompetent management? There is no one yardstick to measure all the companies. Companies may be paying high dividend when they feel that investing in their business might not be a good investment and it’s better to give/return money to shareholders so that shareholders can decide for themselves about the best opportunities to invest the capital/money. The problem arises when poorly performing companies & their managements do not give dividends and destroy the value for shareholders. Therefore, it depends case to case, whether the dividend policy of any company is sound or not. I have used the data provided by screener.in, annual reports of the companies mentioned above and various stock exchange filings done by these companies on Bombay Stock Exchange (BSE) for this article. Out of the companies discussed in the above article, I own shares of Manappuram Finance Limited and Ambika Cotton Mills Limited in my portfolio. I have disclosed stocks in my portfolio on a dedicated page (My Portfolio). I request you to see the list of stocks I own because it is assumed that my views can be biased when I opine about any stock which I own and therefore, have a financial interest. Why I Left Technical Analysis And Never Returned To It! 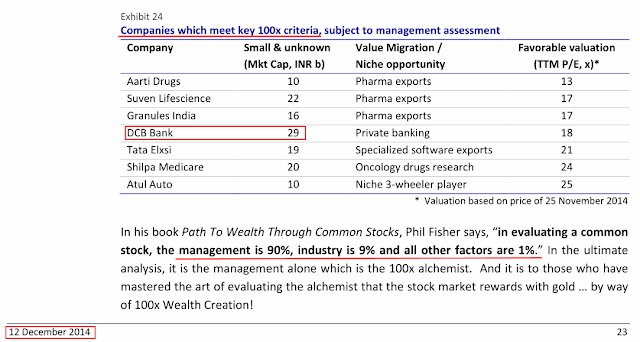 PrevPrevious ArticleWhy Management Assessment is the Most Critical Factor in Stock Investing?